More than any other genre of children’s literature, picture books best represent childhood to many of us. Memories of being read to by a parent, grandparent, or teacher when we were young, maybe curled up on their lap. 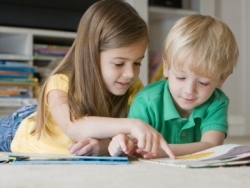 The emotions these books stir up in us probably have as much to do with the memories of that closeness to caring adults as they do with the pictures and words. 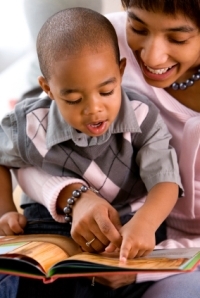 Will the words hold your child’s attention, maybe through humor or an unusual plot? 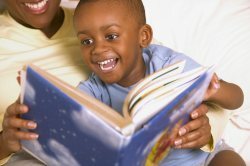 Would you enjoy reading the book to your child? Your own interest in a book can be contagious! Children’s librarians can be great resources when you’re trying to find good books for your child to read. Sales people who work in the children’s sections of most large bookstores should also be able to make some good suggestions. Once you have an idea of what you’re looking for, you can search for these books online as well. Andy and the Lion (by James Daugherty) This was a favorite with the kindergarteners I visited. Brown Bear, Brown Bear, What Do You See? (by Bill Martin, Jr. / illustrated by Eric Carle) One of my favorite books to read to my son . . . and yes, he loved it too. Caps for Sale: A Tale of a Peddler, Some Monkeys, and Their Monkey Business (by Esphyr Slobodkina) The 3rd grader I mentored (Josh) got a kick out of this one. The Complete Adventures of Curious George (by H.A. Rey) Josh enjoyed this one too. Dinosaur Roar! (by Paul and Henrietta Stickland) This one’s a personal favorite – my son LOVED it! Good Night, Gorilla (by Peggy Rathmann) Another favorite of my son’s. Harold and the Purple Crayon (by Crockett Johnson) A favorite with the preschoolers I visited. The Tale of Peter Rabbit (by Beatrix Potter) A favorite from my own childhood. The Very Hungry Caterpillar (by Eric Carle) My son loved this one and soon memorized it. The Wolf’s Chicken Stew (by Keiko Kasza) EXCELLENT book! Popular with all the age groups I visited. Writing a picture book is a little like writing poetry, only more structured. The words in a poem create visual images – things you can experience with your five senses, not abstract “things” that are vague and unclear. This is important in books for small children, too. That’s because preschool-age children can only relate to things from their own world: activities or events they’re familiar with (getting ready for bed, playing outdoors, taking a bath, etc. ), or feelings (loneliness, fear, joy, etc.). Since feelings are abstract, the author and illustrator need to communicate these feelings through events and illustrations that show those feelings. For instance, a story might feature a small boy becoming separated from his mother in a store. The illustrations could show the child hiding behind some clothes, afraid to talk to strangers, and the text could explain what’s happening. Looking at the pictures and hearing the words will probably help a child deal with his or her own feelings of fear better the next time they’re in an unfamiliar situation. As with poetry, words in a young child's storybook need to express thoughts powerfully in as few words as possible. They also need to fit on a set number of pages (typically 24 or 32, although baby books are usually 16 pages). To make it easier to plan the layout of your book, create a “dummy” or an imitation of the finished product. This can be done by folding or stapling blank sheets of paper together. This dummy is only intended to help you figure out where to place the text and pictures on each page. It’s NOT something you’ll be sending to the editor. For information on other aspects of writing children’s books, see my page on writing children’s books. If you’re interested in seeing more information on finding good children’s picture books, or on writing them, let me know.